I was really into art at school, and also loved playing with makeup. The two came together perfectly. After looking into the curriculum of all my available options, TMS seemed like the best choice. After meeting Gabe and Di I was 100% sure that this was the right course for me. They were so passionate about what they do and have tons of experience in the industry. They have tailored the course to be relevant to the makeup industry today. I LOVED it!!! I learnt so much, had a lot of fun doing so and felt like I never wanted to leave! It definitely equipped me for the industry, and TMS also helped with finding jobs at the beginning to get me started. I have been working freelance, doing weddings, TV Commercials, NZ fashion week, music videos, fashion and beauty shoots. 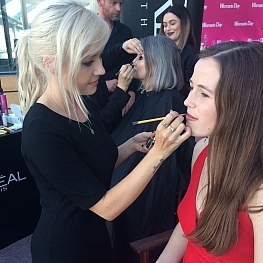 I also work for Loreal Paris as their Beauty Advisor for NZ. One of my latest jobs was doing makeup for Broods for the NZ music awards.